Sports can be an exciting and fun way to get people to work together in order to win. For most kids, organized athletics are pretty easy to join. There are intramural, travel, and high school leagues for the most popular sports amongst teenagers. However, for some kids, especially for those with disabilities, being involved in organized athletics can be difficult. In an effort to allow kids with special needs to have a chance at being part of a team and work with others their own age, the New York State Public High School Athletic Association (NYSPHSAA), in collaboration with the Special Olympics, launched Project Unify. Project Unify has three main goals: to give each and every player an equal opportunity to compete and contribute to their team’s success, to provide kids with special needs with the chance to take on leadership roles in their communities, and to provide all students (regardless of disabilities) to participate in school-wide activities and campaigns. 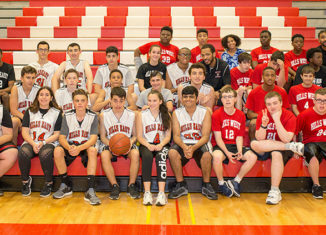 Recently, Hills East, along with other Suffolk County schools, joined in on Project Unify and created the Unified Basketball League.The Suffolk County league consists of seven teams and two divisions. Division 1 is composed of Hills West, Northport High School, William Floyd High School, and Amityville Memorial High School. Division 2 is composed of Hills East, Southampton High School, and Walt Whitman High School. The rules for the games are basically the same as they are for any basketball game. However, out of the five players on the court per team, two of them have disabilities. Not only this, but no player is told which players have disabilities. The purpose of this is to encourage participation by all players and to stimulate team collaboration. Hopefully, Project Unify can continue on for years to come and grow to become an even bigger part of high school sports. Despite the fact that Hills East won the Division 2 championship on Tuesday, May 29th, 2018, the kids on the team don’t play to win. They play to be a part of something bigger; something that can change the lives of a few exceptional kids. Photo courtesy of Chip Parker.